Need a new knitting project? These adorable patterns for baby booties, clothes, hats, blankets, toys, and more are sure to keep your knitting needles occupied as long as there are little ones in your life. Whether you have an upcoming baby shower to attend, 1st birthday party, or grandchild you're just eager to spoil with homemade gifts, you'll easily find something fun to knit. To knit this double-breasted baby sweater, you only need to know knit stitch and a few basic knitting techniques. It's fast and easy to knit, and would make a wonderful gift for a new baby. Make it in navy for a classic peacoat look! This bold and beautiful blanket uses Lion Brand Mandala yarn to create gradient color-shifting stripes. For most of the design, you only need to use garter stitch, so even though it has a unique look, it's an easy project that's perfect for beginners. 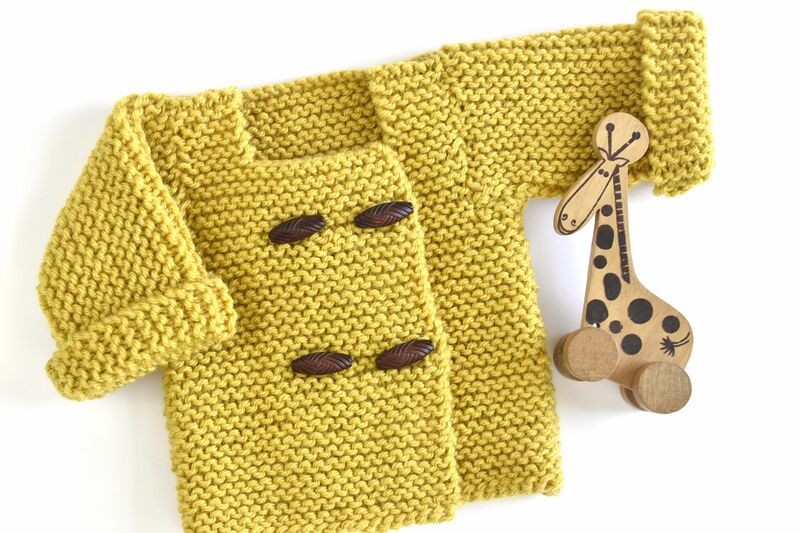 Want to make a knit baby gift that they'll never grow out of? Try this adorable stuffed bear pattern! It's cute as just a simple bear, but you can also embellish it with embroidery or fabric patches, or add a bell or squeaker inside. Plus Loop offers the instructions for knitting Otso the Bear flat or in the round! Julie from Knitted Bliss designed this darling bonnet for her daughter Lila and shares the pattern through her Ravelry page. It's has a vintage style, comes in a range of sizes, and you can work it up in a day or two, making it a great last-minute gift. What could be cuter than chubby baby legs and little feet in hand-knit socks? Probably nothing. But it would be extra cute if everyone in the family had matching socks, and this pattern comes with all sizes so you can make a pair for everyone! This handknit dress pattern takes a traditional style and modernizes it with stripes. It's worked from the bottom up and is completely seamless. The free pattern includes sizes up to 12 months, and is so cute you'll want to knit one in every size! Worked from the center out, this simple baby blanket features a giant pom pom in the middle. It's an easy and inexpensive gift for your next baby shower! Heidi from Hands Occupied also suggests a way to turn this into a lovey with the addition of a stuffed toy. How can you resist this sweet cardigan from designer Taiga Hilliard? The free pattern has an offset button placket with cabling, and the buttons only at the top give it a fit and flare that's sure to impress. A lovey is a mini blanket combined with a stuffed toy, perfectly sized for carrying everywhere a baby or child goes. This one has a knit kitty with a blankie that's similar to a basic dishcloth design, which makes it an easy project for beginners. This gorgeous baby blanket has a delightful knobbly texture that babies will love to rub with their tiny fingers. But it's so lovely that you might want to make a larger one for yourself! Be sure to practice the "knot stitch" a few times to ensure that you get an even tension on those special stitches. Even newborns need cute sweaters! This free pattern for a wraparound sweater will keep your little one cozy and warm. And although it's designed as a striped sweater, you can change up the color and make it solid or with color blocking if you'd like. Knit this little kitty cat hat for your baby or toddler and they're sure to get lots of attention! It would look adorable in nearly any color and it's perfect for both boys and girls. This simple, but beautiful baby blanket has a real wow factor, especially when knit in a marled ombre of warm jewel tones. The center of the blanket is basic garter stitch, but the edges have a lace design (given in chart form in the pattern) to make it special. Keep baby warm and stylish in this hooded knit jacket. When the hood is up it reveals a tree design on the back. Not quite ready to make a garment that your little one will outgrow quickly? This pattern includes sizes up to a child's size 12! 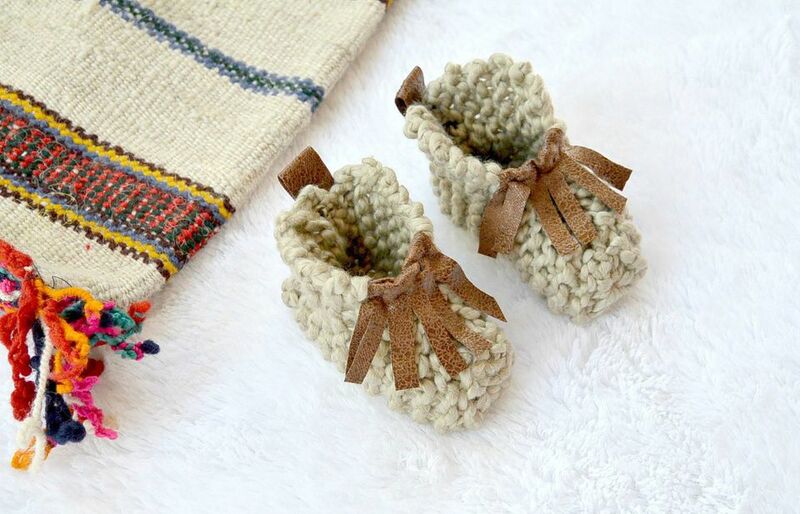 Simple baby booties just got extra cute with the addition of a bit of fringe, turning them into moccasins! Jessica from Mama in a Stitch shares her free pattern for making these beginner-friendly baby slippers that are on trend and fun to make. Worked in a soft cotton yarn, this cabled baby blanket is machine washable, which makes it perfect for babies. The cabling is throughout the entire blanket, giving it a beautiful textural design. OGE Knitwear Designs offers classicly-styled knitting patterns for babies and toddlers. This top-down cardigan has a sweet design on the front that would be suitable for boys and girls. Plus, there's a matching romper pattern to make it a complete set! Knifty Knittings shares her free pattern for this sweet and simple bonnet. It's worked in garter stitch but uses a few special techniques. If they're new to you, don't worry! The pattern includes video tutorials for working short rows, grafting garter stitch, and knitting i-cord. Special delivery! Wrap baby up snuggly in this knit baby envelope. Designed with a hood at the top and flaps that make it easy to swaddle, your little one will feel cozy and secure. These super cute ice cream cones with faces come in any flavor you can knit! Inside you can add a rattle, making this a toy that babies will love and even play with as they get older. The pattern is free from Hello Dolly Knitting, or you can pay a small amount for the downloadable PDF. Looking for a onesie pattern that's unique? The Aurora Romper has a delicate lace pattern that makes this knitwear truly special. At this time the pattern only comes in 9 to 12 months, but the designer plans on adding more sizes. Keep baby's hands warm while preventing scratches with these adorable thumbless mitts. The free pattern comes in two sizes and is available in both English and French, so be sure to scroll down to find the version you need. This delightful hat design has a pointed top, wonderful texture, and small ear flaps. Babies look adorable in it, but so do kids and grown-ups, which is why this pattern comes with all the sizes you need for the whole family! Knit these basic blocks for baby, then add some embroidered embellishment! Not only are they soft and safe for little ones, but they're special because you made them. Want to skip the embroidery? Knit each side of the block in a different color for a fun look without the extra stitching. The winter weather is no match for this bulky baby bunting! The top-down pattern features cabling on either side of the button panel and an opening for buckling a car seat through the bunting.